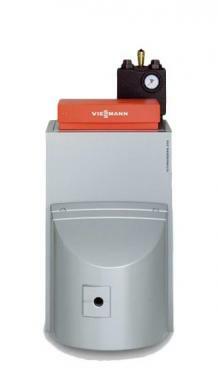 The Vitorondens 200-T is a highly reliable, floor-standing, condensing System oil boiler, designed and manufactured by Viessmann to be installed just about anywhere and be extremely quiet in operation. This is a highly efficient unit, available with an efficiency rating of 97% and an ErP A rating. A 35kW output rating makes this boiler perfectly suited to larger homes with 2 or more bathrooms that have a high demand for heating and hot water. If you require a different output, there’s wide range to choose from, including 20kW, 24kW, 28kW, 35kW, 42kW and 53kW units, meaning that there’s a boiler to meet the demands of just about any home. The Vitorondens 200-T features an affordable cast iron making it perfect for modernisation projects, high-operational reliability that has a long service life thanks to the Eutec Plex heating surface, a cast section with flexible gaskets for durable sealing on the hot gas side, a downstream corrosion resistant stainless steel inox radial heat exchanger, a jetflow system for optimum heating water distribution. This is an easy to operate boiler, thanks to the Vitotronic control unit that features plain text and graphic display, so that you can have maximum control. It will help you to save time and money on installation with its thermal insulation and control unit that are pre-fitted with the Vitorondens 200-T. It can be separated for easy handling and is delivered as a block. With this unit also being able to connected to the internet through he Vitoconnect accessory for operation and service. As this is a System boiler, it directly heats your central heating system and hot water for a storage cylinder. Most of the important parts of the hot water and heating system, such as the pump and expansion vessel are built-in, helping to make it quicker and cleaner to install. You’ll also get a faster response to demand for heating and hot water. Plus, you don’t need to have a feed and expansion tank in the loft. Available with a 7 year warranty, you’ll be well covered long after the installation.